Odoo University Management System brings about Efficient Management of Students, Faculties, Courses & Classes. These days, automation and computerization have made it easier for universities to manage student enrollment, admissions, fee collection, conducting examination etc. ERP for university manages all activities of the university efficiently and precisely. Universities have many departments and centers to manage learning and courses. In comparison with schools and colleges, universities have a greater student and faculty strength; to effectively run an establishment, ERP for university equips universities with a cloud based system that can be accessed across departments, which is integrated with everyday transactional and learning activities. Open source university management system is a transparent and user friendly solution that empowers students and minimizes the efforts of teachers to easen up admission process, examination process, attendance management and announcements or provide updates on campus activities. Hence, with the open source university management system manual errors can be minimised and a teacher student link can be established via the software. Open source university management system eradicates the manipulation and mismanagement of university data that is accessible to staff and administrative staff and any glitch or fraud in the system can be easily discovered. Open source university management system provides admin rights to the head of the institution wherein the functioning of all operations can be monitored on one dashboard. With open source university management system analytics and reports that can be printed as and when needed which regards to any module or plugin or internal functions to maintain records are provided. Open source university management system, backup taken is automatic, time saving and easily retrievable. Data is advised to be backed up on cloud rather than databases. Data is secured by encrypted password and modern security tools. Provision for customization in open source university management system helps personalize the experience of the user and encourages usage of technology to make the project successful. Open source university management system is based on modern technologies in order to support various upcoming applications. Open source university management system eliminates data entry and manual work which is repetitive, tedious and heavily time-consuming to increase the efficiency. Open source university management system provides offline and online technical support for the smooth functioning of ERP, so that technical bugs can be spotted and restored. Open source university management system offers a complete university management solution. It has everything that a university needs to ensure that everything is on the right track and is managed well. Be it a private university or public university, data and information management is a vital necessity. The problem with this is the time taken in the documentation process. More than half of the time goes waste due to these manual things and so on the other hand other work remains incomplete. Hence, an open source university management system helps universities save time and minimize chances of errors. Backup and security function is the main point in selecting open source university management system because nobody would like to get stuck with a broken software, bugs or simply no data at the time of running your university. Considering backup and security functions is very important when selecting the software for your school. Every company will give you the best offer, but it is your duty to go one step ahead and check every point to make sure that you select the best open source university management system for your organization. Your money can be saved if you go for customized software as per your needs. The provider must show you the demo of the ERP for university which can be further simplified for you to manage and later when required. 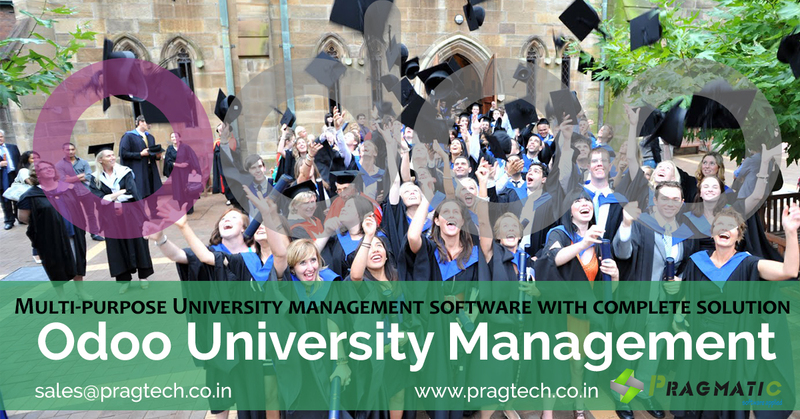 It is better to opt for a university management system that is easy to manage and change as per your business needs. There should be an option to add the features which are really unique from different companies later on. Most ERP solutions for Training and Educational Institutes obtainable in the market at present offers the same functionality and a lot of organizations appraise solutions on the basis of their functional capabilities at a particular point in time. Make sure you select one that is different and good. Conclusion: ERP software solutions are quickly increasing making it complicated for universities to select the most reliable solution for them and select a company that gives a comprehensive after sales services and technical support for extreme utilization of the open source university management system.